Found this at Hidden Persuader. Tom Bihn makes laptop bags and stuff. 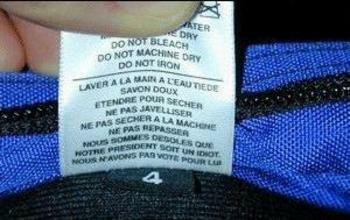 This is one of their bilingual labels. The extra bit of French at the bottom translates as "We're sorry our president is an idiot. We didn't vote for him". That's a brand with a point of view. Thanks to you I have ordered of TB's bags, the ID in fact and look forward to its handcrafted wonderfulness. By the way, what did you think of 118 118's homage to your cog ad?